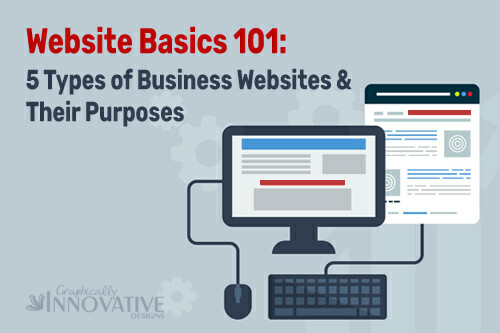 Speaking in terms of content, there are 5 types of business websites. You could have a landing page, brochure site, blog, eCommerce site, or informational website. Several of these types of business websites can coexist on a single site. For example, a brochure site can also have a blog connected to it. But a blog can also exist on its own, without. Knowing what type of website you want will help you to go about finding the right type of hosting site, designer, and what programs or tools you need to use. This is a single page that is built to sell a single product or service. Landing pages typically don't link to any other web page because the main goal is to sell the visitor with little distraction. If you are looking to sell multiple items, then you may want to consider an eCommerce site... which I talk about more below. Brochure sites are also known as mini sites. Usually, these types of sites have the same information that you would find in a tri-fold brochure about a company. They're small sites that typically consists of 5-10 pages. Most small businesses use this kind of site over any other type of website. This type of website is similar to a brochure website but it goes beyond providing just the basic information of a business. Informational or Content-based websites provides educational information about a specific topic, normally what the business specializes in. You would create at least the 5 core pages about your business and it's services. But then you would also branch out and create pages about specific answers or topics your customer would like to know. For example, if you have a dentistry website, you could create pages about specific questions a patient might have like... why is flossing necessary, what is a cavity, how to treat teeth sensitivity. Another example... if you are a wellness coach, you can add pages to your site that answer questions about the latest diets, whether certain supplements are better than others, and tips for preventing specific health ailments. If built right, informational websites can attract visitors looking for answers to questions that you're an expert in. When visitors find that you have the right answers, they will likely trust you and want to use your business as opposed to someone else who didn't provide the information they were looking for. A blog is a collection or series of posts that are made regularly. In other terms, it's like a journal that someone writes in every day. Each written journal entry is likened to a single blog post. The collective group of journal entries are what makes a single blog. Blogs can stand alone or be attached to another type of website like a brochure site. Usually, small businesses use blogs for keeping their customers updated with the latest news and deals of the company. They can be an effective marketing tactic for businesses if you regularly add posts - whether it's on a daily or weekly basis. As long as you regularly maintain and update your blog, you can create a community of loyal followers. If you have shopped online, you have used an eCommerce website. An eCommerce site is the online version of a brick and mortar store but... it stays open 24/7. In contract to a landing page, an eCommerce website usually has a shopping cart feature that allows the visitor to browse multiple product pages and place them in a virtual shopping cart. You can sell as many or as few items as you want with an online store. Then, consider what feature will help you reach your goal. You may find that you will need a mixture of two or more types of business websites to promote yourself. If your goal is to sell homemade soaps, but not have to personally take the orders, you likely need a landing page, or eCommerce site. Or, let's say your goal is to promote your financial consultant services. That means you need a brochure site that would inform current customers of your services or introduce yourself to potential customers. But if you also want to create a hub for customers to stay in touch with your business, and find out when you run promotions or benefit from tips you are giving... you might also attach a blog to your brochure site. There are many combinations you can make of the types of sites mentioned above. But you'll choose the best one for you if you figure out your main goal for getting a website in connection to your business.